At least two people have been killed in an explosion in the center of Kharkov, Ukraine, during a peace march, local media report. Around 500 people had gathered in the center of the Kiev-controlled city for a rally. Those marching in the front were hurt, with Tass reporting from the scene that at least 10 people sustained injuries and three others were killed. Other outlets speak of four and eight casualties. 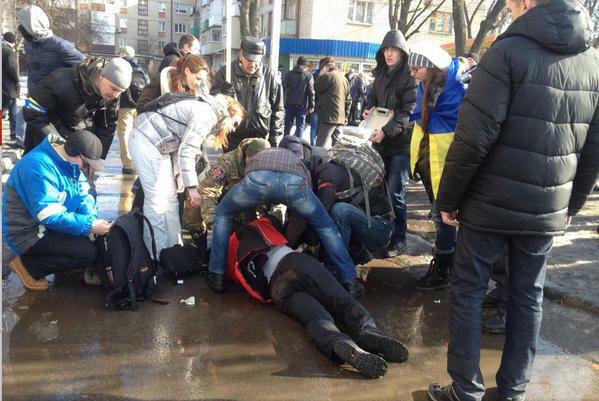 Two people have been killed in an explosion in the center of Kharkov, Ukraine, during a peace march, local media report. Around 500 people had gathered in the center of the Kiev-controlled city for a rally. Witnesses interviewed by TASS said the explosive device was thrown from a passing car. Kharkov’s prosecutor’s office thinks the device was planted. It has launched an investigation into the explosion, describing it as a “terrorist act,” according to the office’s spokesperson, Vita Dubovik, interviewed by ‘112 Ukraine’ TV. A police officer is among the casualties, law enforcers told TASS. “The Kharkov police chief, Anatoly Dmitriev, says a terrorist act is suspected. He has the investigation at the scene under his personal control,” says a Ukrainian Interior Ministry statement. The Ukrainian Security Service (SBU) has announced it has detained people, who could be responsible for the explosion. An anti-terror operation has been launched in the explosion’s aftermath, said Anatoly Turchinov, head of Ukraine’s security and defence council. Obama told a Fareed Zakaria, a member of both the CFR and Rockefeller’s Trilateral Commission, that the United States “brokered” the coup in Ukraine last February. Obama’s candid admission should not come as a surprise following the release of a surreptitiously recorded conversation between Victoria Nuland, the US-Assistant Secretary of State for European and Eurasian Affairs, and Geoffrey R. Pyatt, the US Ambassador to Ukraine. And now they want to arm their armies to kill the Ukrainian people trying to defend the land they grew up on, and they call them terrorists.